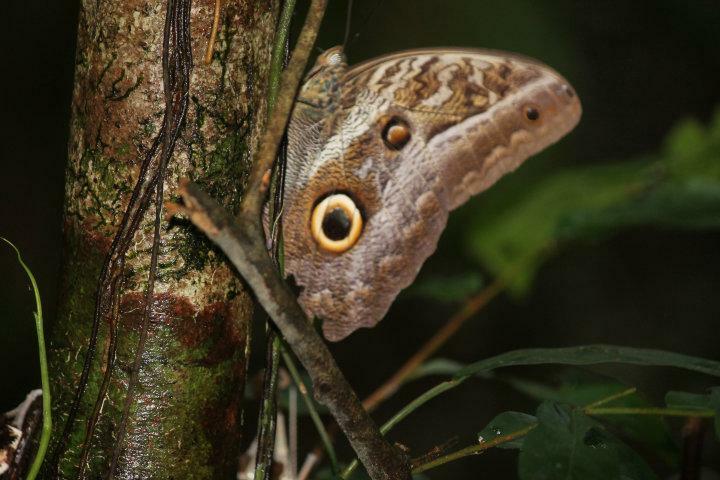 Amason Rainforest - Last Full Day - February 1, 2015 - Blog from Tambopata, Peru | South America!! After all the excitement yesterday, a little bit cooler temperatures, a great dinner and a little wine, we slept much better at last. We woke at 5:00 to dress for our first adventure scheduled for 5:30 am. A bat flew out of the bathroom, and a green frong was on the bedroom wall. Welcome to the jungle. I stated before that our lodge is primitive but I must add that this characteristic in entitely deliberate. This lodge, the Posada Amazonas, is one of the few lodges in the raiin forest that is in harmony with the environment. The lodge works very closely with the Rainforest Aliance and is diloigent about co-existing with the environment in order to cause no impact on the jungle in order to accomodate those, like Stan and me, who want to visit and learn more. There are several communities of native folk nearby. Rather than merely purchase the land and build a commercial lodge, the propperty is "rented." A 40% share of the profits from the lodge is given to the community. Additionallyt, except for the managers, all employees of the lodge are from the local community. One more note I'd like to make is that we do have Internet here. It is provided by sattelite and is available only when the generators are running which is only a few hours a day. So,if my bolog reads in a crazy manner, does not make sense, or uses horrific spelling and grammar, it is because I am putting thoughts down as quickly as I can. i will edit this stuff later.